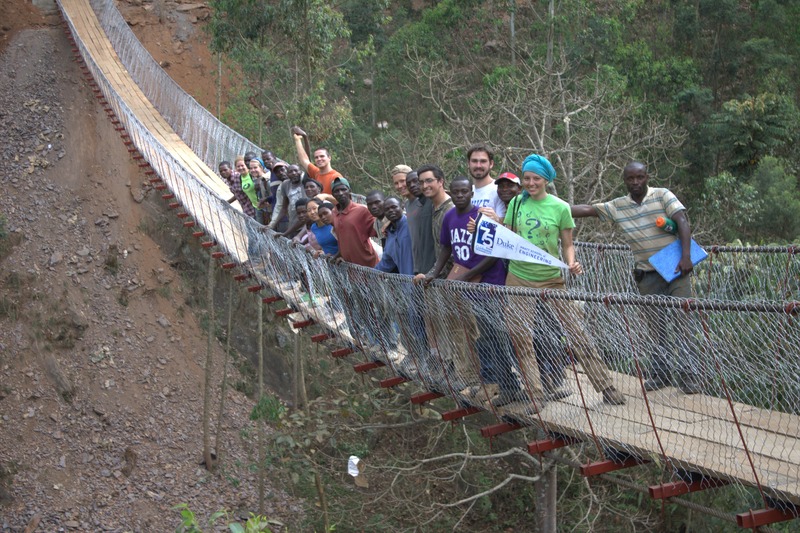 The Rwanda project is partnering with Bridges to Prosperity, a national not-for-profit organization dedicated to improving access to healthcare, markets, and education to build a pedestrian footbridge in Rwanda. The bridge site is located in the Rutenderi cell of the Gashenyi sector in the Gakenke district. Currently, there is a bridge on site but there it is incredibly unstable, and washes away in high rains. There is no railing on the current bridge and people constantly fall in the river. However, several hundred crossings on the bridge take place every day, and so a safe method of transportation is needed. The team of Duke Engineers is currently designing a suspended footbridge throughout the school year and fundraising for the project to be implemented in the summer of 2014. We are collaborating with several interns from the Integrated Polytechnic Regional Centre in Rwanda who will assist us in the construction of the project on the site and we are also collaborating with a team from the Polytechnic University of Lausanne in Switzerland in designing it throughout the school year. The suspended bridge itself will be constructed in an eight week project from May to July and will be built with help from workers from the local community in Rwanda and an advisor from the Bridges to Prosperity staff.